High blood pressure (hypertension) can be lowered by making healthier food choices. The Singapore General Hospital (SGH) Dietetics Department, shares the types of foods to avoid for high blood pressure. and its complications can be prevented by cuting down consumption of salt, alcohol and fat. You have high blood pressure, or hypertension, if your blood pressure reading is persistently 140/90 mm Hg or higher. If left unchecked, hypertension can cause stroke, heart attack and kidney failure, amongst other complications. Some risk factors for high blood pressure, such as age and family history, cannot be controlled. However, many other factors can be managed. For example, you can change your food choices. 8 in 10 Singaporeans eat too much salt! According to the Health Promotion Board (HPB), as many as eight out of 10 Singaporeans are consuming more than the daily recommended allowance of 2,000mg of sodium. “That’s about 1 teaspoon of salt, or 5g, but Singaporeans are consuming 8.3g of salt on average,” says Mr Gary Chiah, Senior Dietitian at the Department of Dietetics, Singapore General Hospital (SGH), a member of the SingHealth group. Indeed, it’s all too easy to consume too much salt when eating out in Singapore. The tasty gravies, curries, soups and sauces added to your plate of rice and noodles are often high in salt and should be avoided. 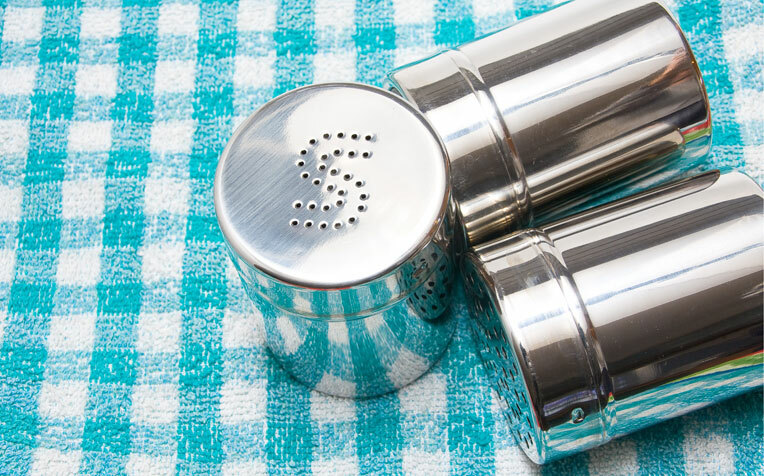 But beyond cutting out excess sodium, there are also other ways you can tweak your diet to better control or reduce your risk of hypertension. When eating out, ask for no or less gravy with your economy rice. Also, have less soups, dipping sauces and creamy salad dressings. Avoid canned foods and soups as they tend to contain lots of sodium. Canned beans for example, can contain as much as 500mg of sodium per serving. However, there are some canned foods with lower sodium content. Look out for foods that come with the healthier choice logo. Frozen peas and pasteurized milk are f​ine, but potato chips, processed meats (bacon, ham, luncheon meat) and froz​en dinners are all too high in sodium. ​Hypertension (high blood pressure) is likely to happen when you're overweight. Asians should aim for a healthy BMI of 18.5 to 22.9 and keep their waistline trim. Asian men with a waist circumference over 91 cm and Asian women with a waistline over 81 cm have a higher risk of hypertension. One good way to lose weight is to reduce your fat intake. One gram of fat contains 9 calories. Carbohydrates and protein contain less than half these calories. Therefore, you can reduce your calorie intake by cutting down on deep fried foods, cream and pastries. ​​It’s especially important to reduce saturated fats which increase the risk of clog arteries. Saturated fats are found in red meat, full-fat dairy products and oils rich in saturated fat e.g. coconut oil. Choose fish, lean cuts of meat, skinless poultry and low-fat milk instead. Read on for good foods that lower high blood pressure.